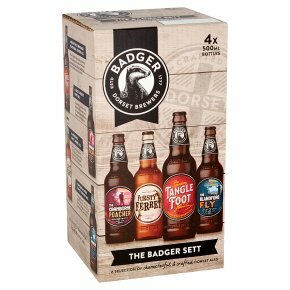 Four of the best from Badger: First Call is a classic ale, fresh and orange-spiked; award-winning England's Own has zippy flavours of white grape and melon; Blandford Flyer has warm ginger notes and rounded sweetness; Poacher's Choice is rich ruby with a touch of liquorice and damson for a soft fruity taste. A Selection of characterful & crafted Dorset Ales Tangle Foot A Deceptively Drinkable Traditional Golden Ale. Finest English Flagon barley, Goldings and Challenger hops deliver balanced flavours of crisp malt and subtle hop, with a delicate pear drop aroma. The Cranborne Poacher A Bold & Fruity Ruby Ale. Crystal and chocolate malts provide a full-bodied taste with sweet, complex flavours of damson and liquorice. The Fursty Ferret A Moreishly, Malty Amber Ale. Dark crystal malt delivers a full-bodied biscuity taste, rounded off with a subtle floral and lemon hop aroma. The Blandford Fly A Uniquely Sweet & Spice Golden Ale. A uniquely sweet and spicy golden ale with a refreshingly different ginger taste, offset with hints of sweet toffee.